It feels as though Spring might actually finally be here and if you’re anything like me, you’re sick and tired of wearing dark colours and want to bring some life and colour into your wardrobe. One of the great ways to brighten up your wardrobe at this strange transitional time, is by adding a good pair of white jeans. You can still wear these jeans with some of your darker tops and jumpers, but the white jeans will help to lighten the overall feel of your outfit. I’ve put together this white jeans look, from high street stores, as an example on how white jeans can be worn. I really like these Slim White Jeans from Mango, £22.99. They’re mid rise, with five pockets and a slim leg. Mango also do Flared and Super Slim Fit white jeans. You really don’t need to spend a fortune on jeans. Yes, with money comes quality, most of the time, but there are some great pairs at ASOS, Next and New Look, all in different lengths and fit. There’s bound to be a pair out there that suits your style and budget. This Coral Frilly Sleeveless Blouse from River Island, £22.00, is really lovely and girlie and goes perfectly with these jeans. 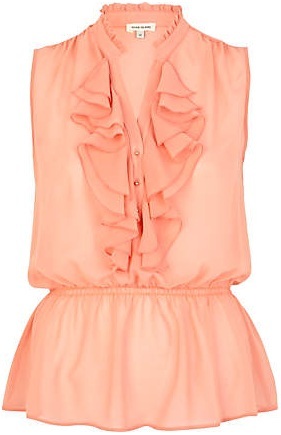 It’s chic in style and ultra feminine, with it’s nipped in waist and frills down the front. 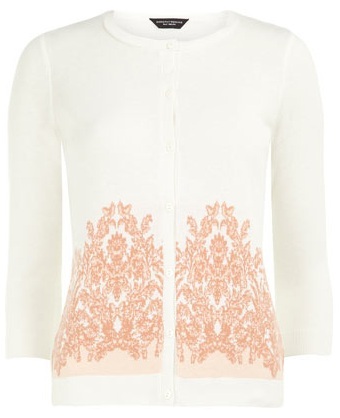 If it’s still a little chilly to wear just the blouse on it’s own, you can add a little cardigan over your shoulders, like this cute Ivory Border Hem Cardigan from Dorothy Perkins. Or maybe wear a wrap around cardigan, like this one from ZARA. A blazer could also be a great way to add some warmth to this look. 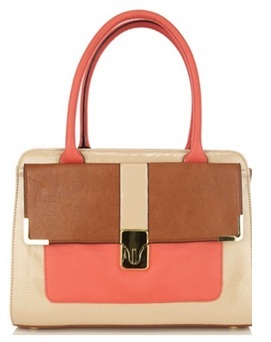 This Bowler Colour Block Handbag from Oasis, £35.00, is absolutely gorgeous. It’s got the matching coral colour blocks to go with this look and has metal trimmings on the front pocket, which makes it look ultra chic and designer. It has a twist lock fastening on the front with a small pocket and the main compartment is zipped. This could be a great addition to your wardrobe and would be a real statement piece. 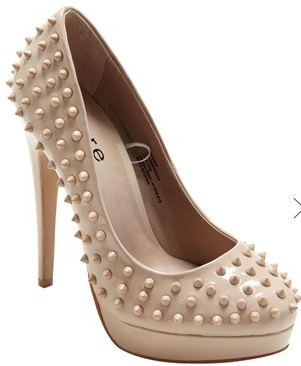 These Spike Studded Platform Court Shoes from Matalan, £20.00 are really cute. I’ve seen spike studded heels and wedges in various places (including Dorothy Perkins, who have some cute spiked peep toe shoes) and these work with this outfit fantastically. At a snip at just £20, they would be a great addition to your Spring/Summer wardrobe and could be worn with almost anything, due to their neutral shade. The stud embellishments would look really lovely with the white and coral combination and lets face it, would be a lot comfier if worn for a long time! I really like these. This Crackle Bead Chunky Wrist wear collection of bracelets from Dorothy Perkins is the perfect final touch to this look. Because the blouse neckline is high and frilly, you don’t want to be adding a necklace and I’d be hesitant to wear any earrings too, but these bracelets would be just perfect. I really love bracelet stacks at the moment and the versatility of them; shall I wear one or two, or shall I wear them all? This stack comes with 6 bracelets, including a crackle effect bead bracelet, a cone spike stretch bracelet (to match the shoes!) and square bangles. I think this look is truly Spring chic and I look forward to hearing if anyone adds some white jeans to their collection this season!